If your home has a kitchen, odds these days are you have a kitchen island, or you’re pining for one. Pining hard! What started as a clever way to add extra counter space has morphed into so much more. And it’s evolving at a breakneck pace. In case you are poised to make some kitchen upgrades soon or just want to drool over the latest designs, here are some kitchen island ideas that could be popping up in homes near you. Simply put: The kitchen island is taking over, expanding ever larger. Karen Foutz, a Southern California mother of six and grandmother of seven, has a 9-by-10-foot kitchen island that’s far larger than a king-size bed (see pic below). “I have to climb up on it to clean it, so I can reach the center,” she says with a laugh. The reason for this expansion is obvious: Since kitchen islands are being used not only for food prep, but also for dining, crafts, homework, and more, more space is required for all these activities. Plus, since open floor plans are all the rage, kitchen islands often serve as room dividers—and, as such, can be larger to better carve up a space. If one kitchen island is good, two is better, right? 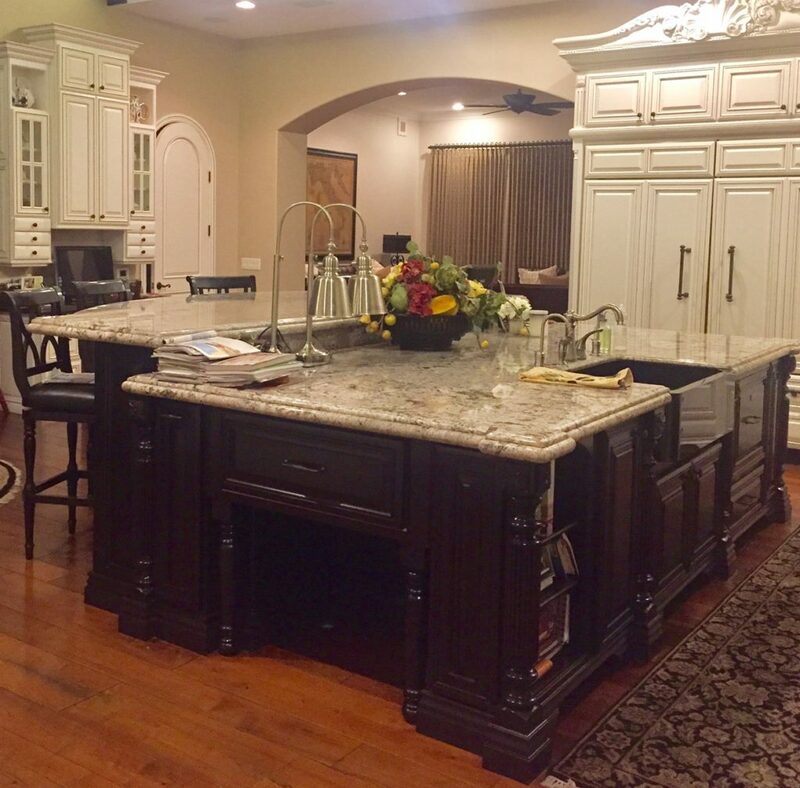 That’s the reasoning behind double islands, which are becoming major selling features in larger kitchens. There’s one island for food prep and another for socializing. Believe it or not, some fancy people (e.g., Kim Kardashian and Kanye West) who are into throwing massive parties have as many as three kitchen islands, making the space seem more like a kitchen archipelago. So many more appliances can be accommodated when they’re not limited to the counters along the walls. Microwaves and dishwashers have been designed with drawers, rather than doors, so they fit nicely into kitchen islands and you don’t have to bend down to use them. As we move away from bulky desktop computers toward portable laptops and tablets, the kitchen island has become the ideal place to set up shop—for work, entertainment, and more. Parents preparing a meal can easily keep track of what their kids are looking at on their computer screens while they’re doing their homework on the kitchen island. 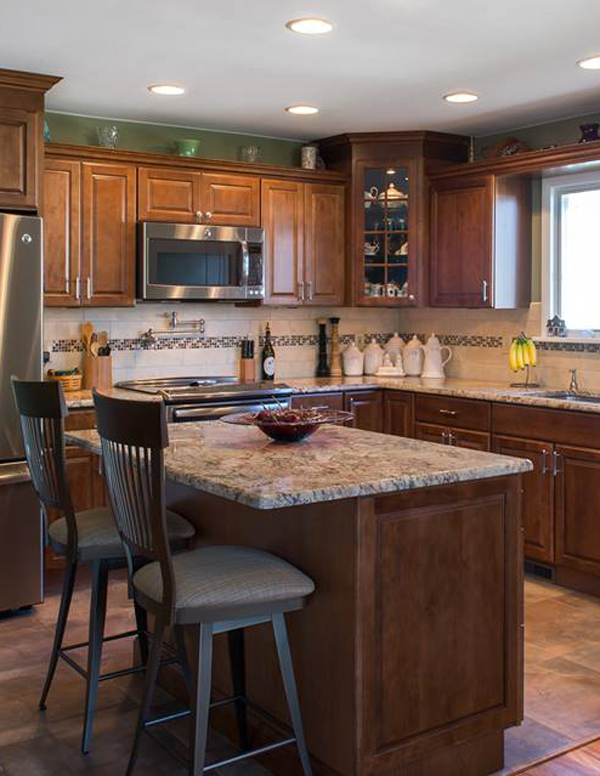 Crafts projects that require access to a stove, sink, or oven are more easily done on the kitchen island. And baking that requires hours of kneading, shaping, filling, or decorating is so much easier when you can sit at an island rather than stand at a counter. Just about the only domestic activity that doesn’t take place there is sleeping, but it’s probably only a matter of time before some designer comes up with an island that doubles as a foldout bed. Can’t wait! No room for a kitchen island? Now if the kitchen island craze has got you seriously depressed because you live in an older home or an apartment, or you just plain don’t have room, fear not! Designers have come up with all sorts of clever alternatives to built-in kitchen islands, some as small as 1 square foot! And many are on wheels, so they can do double duty as kitchen island, bar, serving cart, etc. So no matter how much (or how little) room you’ve got, just know that your kitchen island dreams can become a reality.